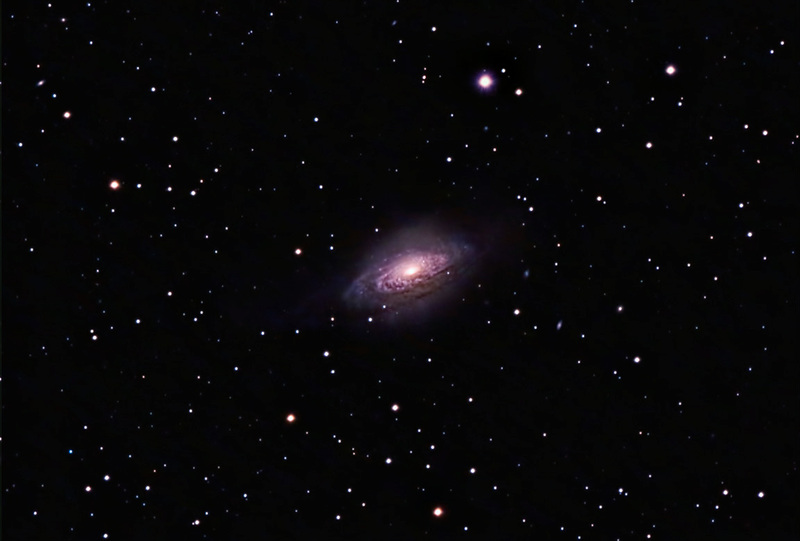 NGC 3521 is a flocculent spiral galaxy that is located approximately 35 million light years away in the constellation of Leo, the lion. It was discovered by William Herschel in 1784. The galaxy has a whispy shell, lending to its common name: The Bubble Galaxy. This shell is likely the tidal debris resulting from long-past mergers with other galaxies. This has caused the galaxy to lose its characteristic spiral arms and create numerous star-forming regions. Processing: Images were focused using Live View. They were converted to TIFF format using Camera Raw. They were aligned and combined using ImagesPlus. The final image was adjusted in Photoshop. Sharpening and noise reduction were done using Topaz Detail and DeNoise respectively.